Managing the diets of overweight or laminitic horses and ponies is often a huge headache for owners. Neither category should be starved as this can lead to further issues such as ulcers or colic as well as mental stress. Dietary restrictions however are often necessary which usually means that horses and ponies can be missing out on vital essential nutrients, and this is when Lami Low-Cal can play an integral part of the diet. Lami Low-Cal can bridge those nutritional gaps and the digestive enhancer and gut health packages included in the formulation will assist in reducing acidosis and stabilising the gut PH as well as improving forage digestion. This will keep your horse or pony replete with the nutrients needed on a daily basis to ensure he stays healthy. Lami Low-Cal is super low in starch and sugar and additionally contains no added iron so is ideal to feed to insulin resistant and Cushing’s horses and ponies. 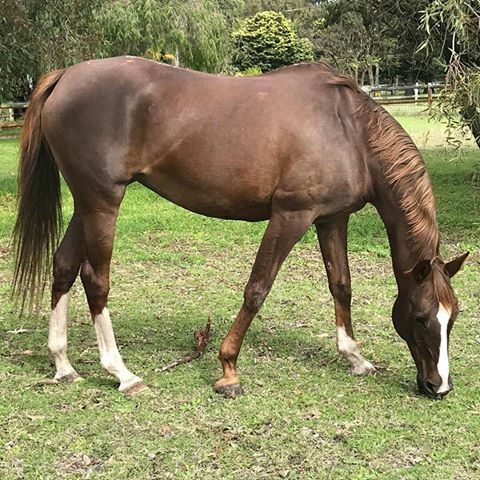 Many of us know the pain of trying to provide our overweight horses and ponies the right levels of nutrients when on a restricted diet; even worse when there are metabolic problems involved. Our Lami Low-Cal bag cover pin-up boy is Dominante, a purebred Andalusian stallion who has been a good doer all his life so needs his diet managing carefully to ensure he avoids metabolic problems. Take a look at the links below for even more information on why you should consider Lami Low-Cal as a valuable addition to your horse or pony’s diet. Feed at 100 g per 100 kg of body weight, do not exceed 200 g per 100 kg of body weight. Please weigh to check the amount. Introduce gradually over a week. Commence feeding with 100 g in the night feed. Feed as a single amount or over 2 feeds. 1 kg plain chaff or mixture of chaff/beet pulp or any other fibre feed product. NB: Hay, chaff, beet pulp etc amounts can be adjusted up or down depending on your horse or pony’s current condition, pasture access etc. NO grain/sweet feeds of any kind. Laminitic horse or ponies should not be starved, maintain slightly restricted fibre levels by feeding in slow feeder haynets. NB: Wheat feed refers to outer husk of grain not whole cereals.